“Artist designed bike racks provide yet another avenue to integrate art into our daily lives while enhancing the community,” said artist and owner, Ken Thompson of Flatlanders Sculpture Supply. 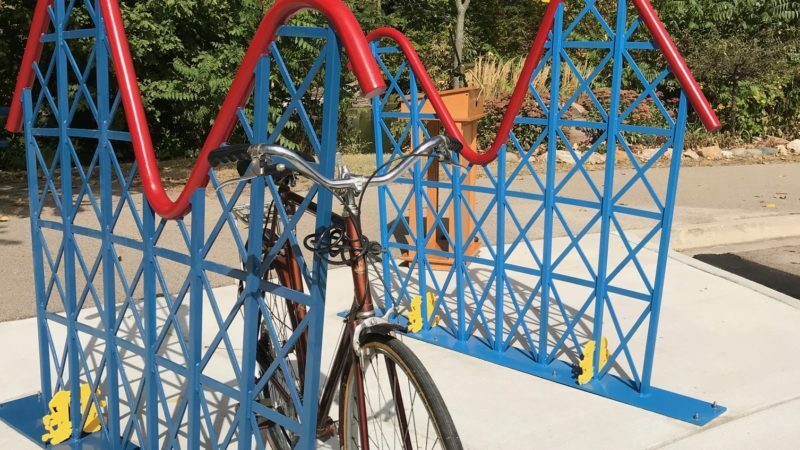 The rollercoaster is one of three functional bike racks designed by Flatlanders. A green fish is located at Jaycee Park and an owl is located in the Grand Ledge Area District Library parking lot. The Lansing Economic Area Partnership (LEAP) with support from the PNC Foundation awarded the City of Grand Ledge $10,000 through their competitive Public Art Grant program in 2017. The grant fully funded the three functional, vibrant art pieces that encourage people to visit, explore, and enjoy all that Grand Ledge has to offer.